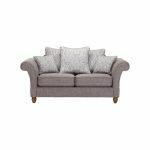 The Dorchester 2 seater pillow back sofa in Civic Smoke with Silver Scatters combines traditional elegance with comfort, making it the ultimate place to unwind at the end of a long day. Featuring plump-free fabric seat cushions, sumptuous pillow back cushions, and complementary scatter cushions for an extra touch of luxury, it promises to offer comfort and relaxation every single day! Built using durable hardwood in the frame and feet, the Dorchester 2 seater pillow back sofa is designed to stand the test of time. Great as a standalone piece, it can also be incorporated as extra seating within a larger layout. Explore the complete Dorchester range to find coordinating pieces, to create a cohesive and welcoming look throughout your home.